I’m a little disapointed in the lack of progress the pictures show but hey! Slow progress is still progress & it ain’t over yet. 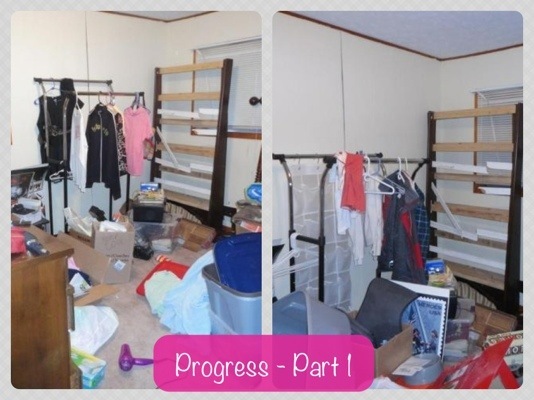 The room actually does look much more improved than the pictures show, but hopefully by the end the pictures will show it too. 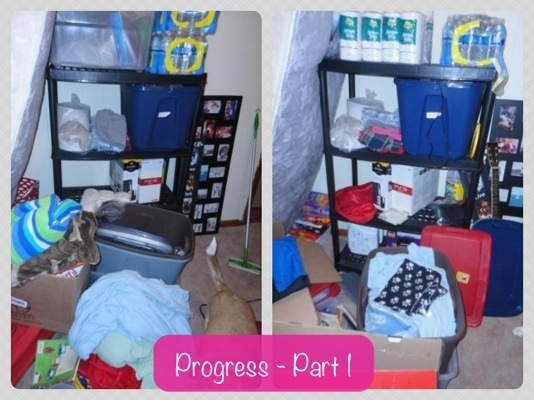 In the first picture I moved the huge tote & sorted it because it honestly had stuff that could be sorted in smaller boxes & some that could be trashed. Some of the blankets that were in the floor are now in the brown tote for storage. It doesn’t look like much, but every little bit helps! 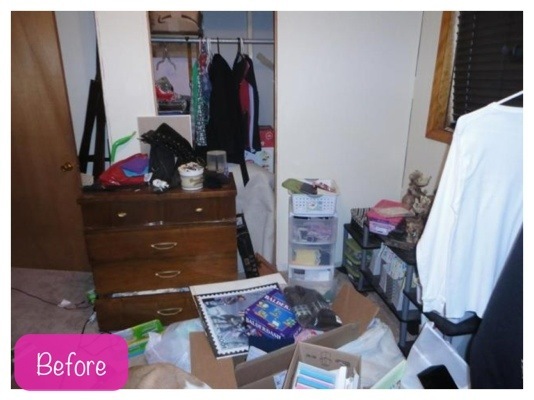 It felt good to get some of that junk out of there – even the small bags because I still noticed a difference in the space. There was another decent sized box of things that I was able to sell but it left the house before I got a picture of though I won’t really complain on that since it gave me more room & brought in some money! The old bunk bed frames need to go obviously but I think have to wait until our trash does bulk pick up which is the first trash run of the month so that won’t be until April 1st. I don’t believe we have a better option for disposal but I’ll ask around since that’s still a couple weeks away. If you notice the clothes stand is a few pieces shorter – I decided there was no sense in keeping shirts I dont want/wear/need so I added them to one of the donate bags as well. 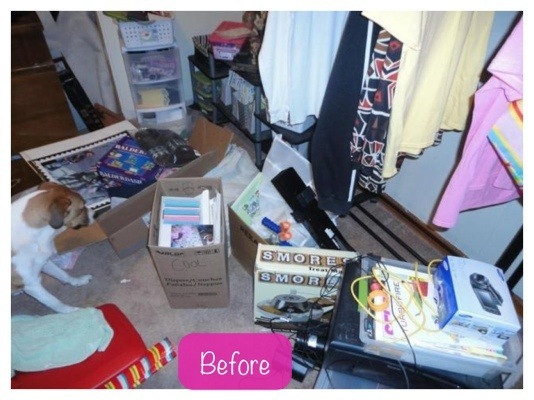 The floor looks a little worse in the picture on the right even though that’s an update picture, but the box of overflowing stuff in front of the large stamp was a donate box so it’s already gone & I was in the process of sorting & tossing more stuff in the second picture but went ahead & took it because I liked the bare look of the clothes stand. I’ll be tackling the room even more this evening to keep this thing moving & I’ll post those updates soon. I’m linking up with Org Junkie! I had taken these Before pictures the other day & finally got around to posting them. I agree with others who have posted that they think putting it all out there makes them more accountable. Plus who doesn’t like to receive feedback/suggestions that could help you with your process? I know for myself I will take any & all suggestions/recommendations. 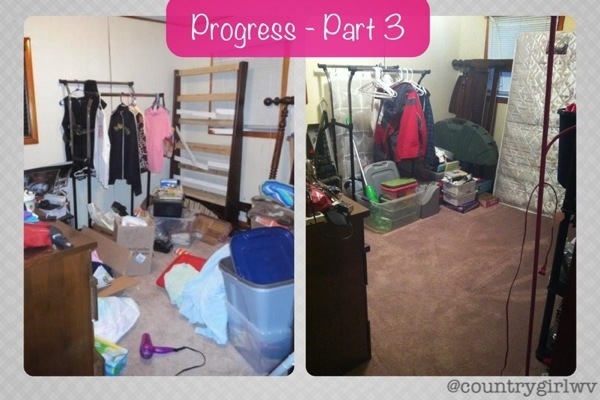 The first picture is a view of the floor facing the closet towards the right. The stack closest to my right is a tote of cookbooks that I’ll be keeping plus the printer & items on top of it. The other boxes are all to go boxes except the one that says “cool” on it. Those are VHS tapes & it says “cool” because I wanted to make sure to keep them in a cool place when I moved. I realize now as I’m explaining it, that I’ve not been in that box since I moved in Nov 2011 which may be a sign that I need to go through it & purge some of those VHS’s – thanks guys! 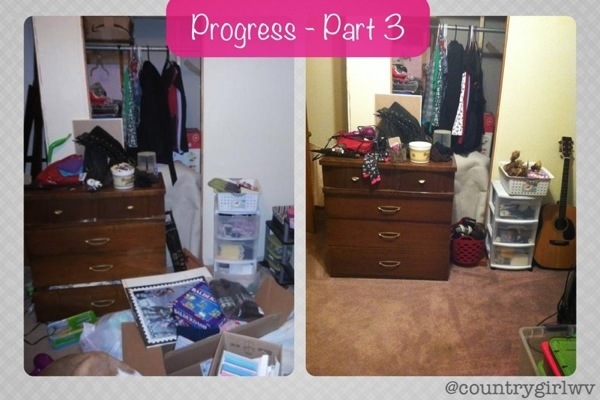 This is a view facing the closet – what a disaster the floor is! This room has entirely been my dumping ground since I don’t have an out building but that is not acceptable! This is a view towards a back corner – the green box is my bow case so that will be staying but could be stored better. 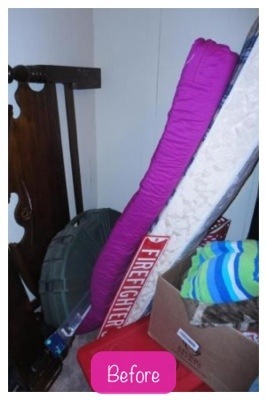 The mattresses are both for sale so hopefully they’ll be gone soon. Sadly – this is the most organized area of the room. The black organizer stand is a big help but not all totes fit there. It does help in keeping a lot of stuff off of the floor though. The grey & brown tote in front of the stand are both empty & are just in there to help me organize so that doesn’t count as clutter, right? We’ll do a small background on this story starting with in November 2011 I moved into my Pawpaw’s old house (he had passed away earlier in the year) & saying “it needed some work” was putting it mildly, but hey it beat the trailer I had been living in on a rented lot that didn’t have a fenced in yard. The house itself was in fairly good shape as far as stability & not having leaks & all of that but an old man had lived there alone for several years which meant minor or no upkeep at all not to mention borderline hoarding of random junk in the bedrooms. I loved my Pawpaw dearly but I can’t justify keeping the boxes to every coffee thermos ever owned. Actually getting to move into the house was a long & lengthy process which I may post about some other time but that’s a story for a different day. I’m not crafty or skilled at anything really & I’m okay with that – I’ve just honestly never really had the experience for one thing but I’ll give anything a shot once. When I first moved in I was with my ex who thought he was a handy man – keyword there being “thought.” Don’t get me wrong he was decent at somethings but he never knew when to admit he couldn’t do it or that we should probably have someone else do it. Point being – most things that got fixed around the house were done by others & not either of us. Needless to say though when we split & he moved out – so did the tools unfortunately. Luckily my parents only live a few miles up the road though so I still have fairly easy access to tools when needed (the few I know how to use anyway haha) but I do need to invest in my own set even if it’s just the basics. Moving on – 3 weeks or so ago the handle on the gate lock broke which wouldn’t be a major deal except I have 2 dogs that I love dearly & I enjoy the convenience of letting them out into the yard without constant supervision. They don’t typically go towards the gate but they are aware that’s where we go out for car rides so that was a problem. Living up the holler my entire life except for a couple of years taught me a lot about rigging stuff up to make do until you could fix it which has come in quite handy. So I found a small bungee cord that had hooks on it & TA-DA I had a makeshift latch that would work temporarily … but that got old quickly. It was annoying to hook & unhook it all the time especially if I was carrying stuff. I know, I know – this isn’t a major ordeal but I’ll tell you – having a working regular gate latch is a wonderful blessing. I made an unsuccesful trip to Lowes one night to try to find a replacement handle where I found out that this old style of gate latch could be hard to find. My lovely boyfriend Tate stopped by a little Mom & Pop hardware store (which I prefer over big stores anyway but sadly enough there aren’t any close to home) where they had a slot for it but it was empty. We waited a few days & he tried again only to find out that the store had tried to order it but the supplier was out. The lovely people however referred us to a fence company who they said should almost definitely have it. So I made the trip down there after work yesterday evening to find a lovely old man who looked the item up in a binder (not a computer) & wrote my receipt up by hand (not a printout). He was so friendly too & even gave me some bolts which I had told him I didn’t think I would need but I wasn’t sure – it made my day! So I head home with my new gate handle ready to do work! I’m not sure how it slipped my mind that I would need tools to get the job done but it did. I should hang my head in shame for that one! Let’s also add that my Dad is out-of-state on a golf trip & my mom is worse than I am when it comes to tools but again luckily they just live right up the road. So I go there & track down a wrench to get the nut off the gate. I get back to the house & attempt to remove it only to realize I need another wrench to hold the bolt still while I remove the nut. I’m beyond blessed with close family & luckily my cousin also lives right up the road so I borrowed a wrench from him as well. So here it is 6:30 now & raining & I’m out there trying to get this damned old rusty nut & bolt off the gate but by golly I did it. I did it so well I snapped that bolt into 2 pieces * insert arm flex here * haha Like I said – it was old & rusty but still I was a little impressed at myself. So I finally got the old hardware off & I go to install the new latch & not 5 minutes later TA-DA a shiny, new, perfectly operating latch! I definitely felt accomplished & I had to laugh at myself too. My pawpaw had always told my dad that I was the boy he never had (because Dad was blessed with 3 girls, no boys) & it made me laugh because I knew my pawpaw would’ve been proud of my handy work on the new latch. 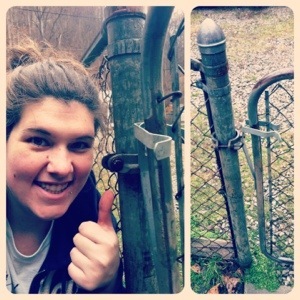 Also neither of my sisters would’ve even attempted or thought about replacing the gate latch themselves. Before anyone starts questioning why Tate didn’t replace – he was still out running some errands after work so I had all that done before he got home. Not to keep further honking my horn but I also figured out how to remove the drain/stopper from the bathtub. That’s not really that impressive because the screw was right there in the middle of it – but we had entirely missed it when we looked before. Regardless, I realized there was a screw there so I tracked down a screwdriver (one of the few tools I do have) & popped that right off there. Then I removed some of the hair/gunk/whatever the hell that was that had been stopping up my drain & then poured some clog remover (I don’t remember the name of it) down there in hopes that this would finally help the horrible drain issue. 20 minutes later hot water ran down that baby smooth as ever. That plug hasn’t drained that good since before I even moved in there so I was pretty excited about that. No more standing in inches of water while taking a shower! Or waiting 30 minutes for the tub to drain after a bath. Okay so maybe 30 minutes is an exaggeration but not by much. So to sum up this novel of a post that was only going to be a short update I feel pretty accomplished after all my handiwork yesterday. While I get that it wasn’t extreme or extensive by any means – I’m proud of what I did & now I’m ready to attack more issues in the house which could be good (or dangerous haha) only time will tell. I hope everyone has a lovely evening & I’ll leave you with a picture of my lovely work! I don’t know if I’d said it before but to be as young as I am I have a terrible memory! Don’t get me wrong I don’t think I’m still 18 & fresh out of high school but at 26 I do feel like I should have a much better memory than I currently do. Maybe I should start playing my Brain Age game on the Wii more or something of that nature to get my mind really working every day. Who knows? I just know that it scares me to think of how terrible my memory will be at 40 if it’s already this bad. Point being, I forgot to mention another resolution in my last post – the money/debt reduction resolution. Every one loves to talk about money, right? Yeah me neither unless it’s a certified way to make more :) Anyway – I had looked into a credit consolidation program because quite honestly I was just in way over my head. I had too many cards, too much money on them & way too high interest rates to ever get anywhere on my own. While I know it will negatively affect my credit score for a while, once they’re paid off I can start working my way back up & with much fewer credit cards which means less debt to still be paid off. Another great thing is all the cards I filed on will be paid off in 4 years. There’s no way I could have done that on my own, not to mention this program lowers my interest rates INSANELY. Which is another bonus. I hate that it came to that point but if I ever wanted to get out of debt fairly decently & be done with it – this program was the answer. & after figuring out how much money it would save me in the long run, it was well worth the temporary negative impact to my credit score. I understand this isn’t for everyone & some people would scold me for even doing it, but to each their own & I saw more power to you for whatever works for you. On an even better note – the weather this weekend was absolutely beautiful! I was able to let the pups out & run out some of that pent-up energy! It was funny to watch them too – they make me laugh when they run & get all wild. The boyfriend & I also straightened up the back porch some & swept it off which made it look a lot roomier & much better. It’s crazy how much just dust/dirt/dog hair can make a porch look so dirty. The boyfriend also raked up some leaves in the yard so it looks a lot nicer out back & we discussed some plans for the yard once the weather gets warmer. 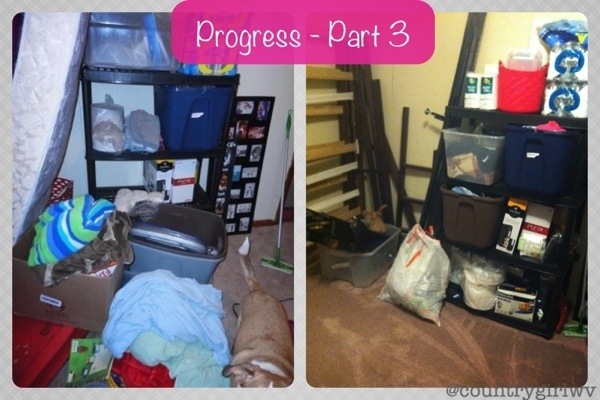 I can’t wait to get an out building & then really overhaul my totes & inside the house for better storage! I’m ready to dive into the work on the house I should’ve started long ago when I first moved in. This is definitely going to be a great year! Over a month since my last post, really? That’s just pathetic. It definitely doesn’t make up for the entire month but for the last week I’ve felt the worst I have ever felt with an illness. The entire week. It was terrible & I don’t wish that on my worst enemy. What made it really bad was that I couldn’t pinpoint anything so I never made a trip to MedExpress or anywhere. I basically just turned into a partial zombie & slept the majority of the days. While I was grateful for the extra time at home with my babies I still felt absolutely terrible & I am so glad to finally be getting over it. I was starting to worry that would never happen. I’ve also been rethinking working too many goals at one time. While I don’t think it’s a terrible idea, I’m not sure it would work best for me. Wouldn’t you know though these great wireless headphones I had ordered came in right before I contracted the illness so I didn’t get the opportunity to try them out. I’d really like to try them out soon but I’m going to give myself a few more days to fully recoup first just so I don’t take any chances. We have a Dirty Girl Mud Run coming to our area in April & I’d really like to get involved in that especially since it’s not really competitive & let’s be honest – they had me at the dirty+mud. So I definitely need to start some kind of exercise before doing that so I don’t look completely un-athletic. So while the exercise goal has been put on hold slightly I’m still trying to go full blast on the organizing front. Obviously it was put on hold last week also because honestly the only thing I accomplished last week was sleep & the occasional shower (yeah it was that bad)! However since my last post though I did empty & reorganize my cabinets in the bathroom so that was a nice change. I’ve recently thought of some more ideas to try as far as rearranging that would be more beneficial so I’m going to try a few of those out tonight. Hopefully at least some of them work. 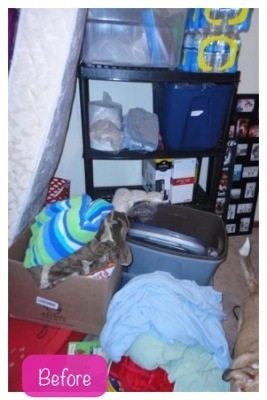 I did watch quite a few episodes of Hoarders:Buried Alive while I was off so that obviously gave me some inspiration. I hate watching the shows that are house flips though because I’d love to have just a fraction of their money to flip my own house. Don’t get me wrong, I’ve seen much worse, but this house has more potential than I’ll ever be able to give it. I’ve also noticed I have 0% decorating skills what-so-ever. I can pick out colors & themes but that’s not really that hard. What I can’t do is find the stuff that really make it feel homey like decide a layout for picture frames & shelves & things to hang on the wall, etc. My living room doesn’t have a single thing hanging up & I’ve been there over a year. I feel like everywhere I’ve lived has always looked more like a dorm than a house & hell some dorms look more homey than my houses have. I’ve never even had a coffee table & the only end tables I’ve had are the 2 pack ones from the dollar store that were supposed to be temporary. I did find a set I like at Wal-Mart though so that will be one of my soon future purchases, though the very next thing I’d like to spend money on is an out building. I need that storage so bad it’s not funny. I didn’t realize in the move just how much I’d miss the building from the trailer where I lived before. It was an immense help in the house looking decent. Regardless of decorating skill though I need to get the house more organized – my kitchen table is an absolute disaster which I feel like is something I inherited from my mom where it becomes a dumping ground for everything. That is a HUGE no no & you’d think by now since I’m aware of it that I wouldn’t do it — wrong. 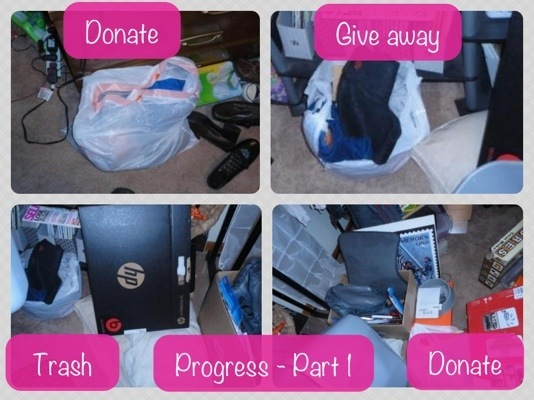 I started this post to state that I intend to sign up (late of course) to Organizing Junkie’s 31 Day Organizational Challenge that I would like to do for the front bedroom that is also currently a dumping ground. You know how some women have a Monica closet? Well I have a Monica ROOM! So hopefully tonight I’ll remember to take some before pictures & figure out how to link up to the challenge & might I add challenge will definitely be the most appropriate & fitting word for that front room. If I can get it straightened up this month though it would definitely be a major accomplishment so here’s to giving it my best! Let’s just hope my memory doesn’t fail me this evening to remember to take before pictures before diving in on a few ideas for that room this evening.